The Holiday Inn Express Hartford hotel is conveniently situated in the heart of the &regInsurance Capital&reg and is easily accessed from I-91 and I-84. 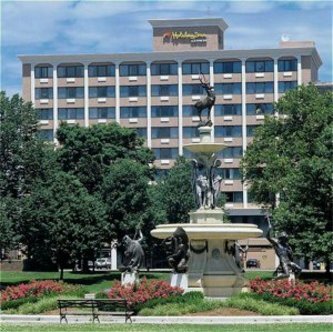 The hotel is located directly across from Bushnell Park and features views of the Capital Building. We are just steps away from downtown, the XL Civic Center, the Federal Building and we are only a block away from Union Station. We feature 96 handsomely appointed guest rooms with a king size or two double beds. All rooms have two line phones with data port and wired high speed Internet service. The Holiday Inn Express Hartford hotel is a 9 story building with over 1400 square feet of event space and offers on-site parking. Our experienced sales staff can assist in detailing your special event or conference and is eager to wait upon you. Visit Hartford, CT and Stay Smart at the Holiday Inn Express hotel. This hotel is committed to providing accessible facilities under the American Disabilities Act. If your accessibility needs are not met, please contact the Hotel Manager on Duty. Should you require additional information regarding accessible facilities for guests with disabilities, please call 1-800-Holiday (U.S. and Canada) or contact the hotel directly. For the hearing impaired, TDD service is available at 1-800-238-5544 within the U.S. and Canada.